In addition to the free-look document coming to you in an email, it is added to the case’s page on PacerPro. If I were to tell you that a new service could help you avoid a $40 million mistake in litigation, would you be interested? The mistake to which I refer was Sidley Austin’s failure to timely read orders referenced in a notice of electronic filing (NEF). The orders denied Sidley’s post-trial motions filed on behalf of AT&T after it was hit with a $40 million verdict in a patent infringement case. Because Sidley did not read the orders in time, it missed the deadline to file an appeal. A new service being launched this week by PacerPro could have helped avoid this outcome. On top of that, it solves a problem that vexes many law firms – the retrieval of electronically filed documents in federal district and bankruptcy courts. The new service automatically retrieves the documents referenced in NEFs from PACER and sends them to you by email. Whether the NEF references a single document or a dozen, you get them all in your inbox, available on your computer or mobile device. The entire process happens within moments of the NEF going out, no matter what time of the day or night the notice is sent. In addition, the documents are stored in your “My Cases” page on PacerPro where they remain available anytime for individual or bulk download. When lawyers are involved in federal court litigation, the PACER electronic case files (ECF) system sends them email alerts whenever a new docket entry is added to the case. Called notices of electronic filing (NEF), these alerts contain a hyperlink that provides the attorney with a free download of the newly filed document or documents. This is typically referred to as the “free look” document. PACER sends NEFs to counsel in real time. As soon as a document is filed with the court, PACER sends out the NEF. The NEF describes what was filed and provides the link to the free-look document. The recipient can click on the link and view the PDF document. The courts consider these NEFs to constitute delivery of the document and proof of service to all registered counsel. The AT&T case notwithstanding, this notification system generally works just fine. Even so, its implementation in law firms can have several downsides and even dangers. A very real danger for any lawyer is missing the email altogether or not seeing it in time. We all receive too much email. Miss the NEF that pertains to a document that requires a response and there could be trouble. The case could be compromised and the lawyer could face malpractice. On top of that, the process of managing NEFs can be tedious and inefficient. At larger firms, support staff are often assigned the task of downloading, labeling and filing the free-look documents. If a filing includes multiple documents, staff must separately download, label and file each one. Typically it is the staff person’s job to then distribute copies of the documents to the members of the trial team. That can be a problem when the filing comes in after hours and the lawyers want immediate access to it but there are no staff on hand to retrieve and distribute it. Still another problem with this system is repetitive cost. Sometimes lawyers fail to download the free-look document and then must go back to PACER and pay for it. In some cases, the document is not made available to other members of the litigation team, so they must go into PACER and pay to get access to it. Finally, there is problem of which costs clients will tolerate. Increasingly, clients are unwilling to pay the staff and PACER costs of having their law firms download, label, sort and distribute these documents. PacerPro’s new service addresses these issues by automatically retrieving a firm’s free-look documents and then making them available both by email and online. It does it in real time, within moments of the NEF notice going out. Here is how it works: The NEF system for district and bankruptcy courts allows attorneys to authorize duplicate mailing of NEF notices to up to five email addresses. PacerPro provides users of its new service with a unique email address that the user then adds to his or her ECF profiles. 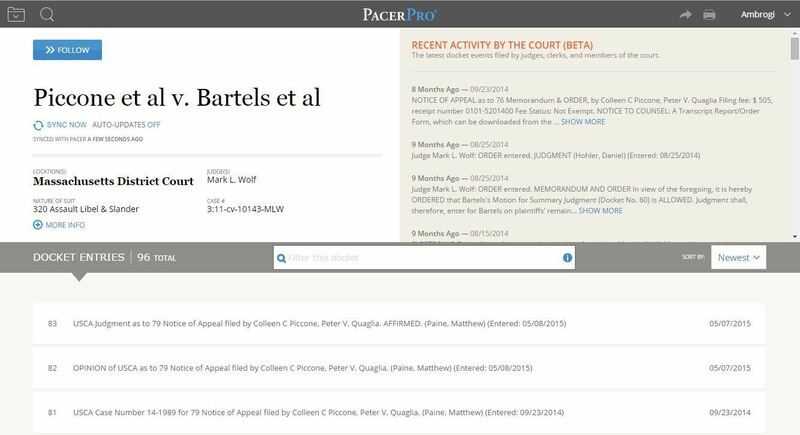 From then on, whenever the court sends an NEF, PacerPro immediately retrieves the free-look document and sends it to the user as an email attachment. If there are multiple documents, PacerPro retrieves and sends them all. The user gets the document right in his or her email, without ever having to log in to PACER or download anything. The documents are also stored on the user’s or firm’s My Cases page on PacerPro, where they can be downloaded at any time without incurring additional PACER charges. When there are multiple documents, they can be downloaded as a .ZIP file with one click. The one limit on this is if the aggregate size of the free-look documents exceeds 25 megabytes in a zipped format. In that case, PacerPro sends an email with links to the documents on its website. As an added safeguard, users can also set PacerPro to automatically update its docket listings for the case and alert you to any changes in the text of docket entries. Because docket updates incur charges on PACER, PacerPro can turn this feature on or off as they wish. Users can always update dockets manually on PacerPro with a single click. I spoke to users at two law firms who have been testing the beta version of PacerPro’s NEF service and both gave it high marks. J. Hoke Peacock III is a litigation partner and chair of the technology board at Susman Godfrey LLP. He initially tested the service with a half-dozen lawyers on a single case. They liked it so much that they now use it on all their cases and Peacock is preparing to roll it out firmwide. For his firm, the service has two benefits, Peacock told me. One is that it eliminates repetitive PACER charges caused by multiple downloads by different attorneys of the same document. The other benefit is that it eliminates the inefficiency of having support staff handle the downloads. The firm’s previous practice was to have a legal secretary download the free-look document and then circulate it to the members of the litigation team. This sometimes created delays in getting documents to attorneys, especially when the NEF notices arrived after work hours. I also spoke to Evan Melluzzo, managing clerk at Schulte Roth & Zabel. At his firm, the previous practice was for someone on his staff to open the NEF email, click the link, retrieve the document and then forward it to the litigation team. “Now with PacerPro it’s streamlined,” he says. “When the NEF comes in, we do nothing.” Instead, all the attorneys get PacerPro’s email with the document attached and the link to the case page. The service has also cut down on the firm’s PACER costs, Melluzzo says. Previously, attorneys would continue to use the link in the NEF notice to retrieve the document. But because the NEF allows only one free look, those other clicks would incur PACER fees. Now the attorneys get the document directly in their email. As I’ve noted before, PacerPro is a free service for searching and managing PACER filings. This NEF service is being offered as part of a new package of premium, paid features that are over and above the free service. Unlimited bulk downloads (free users will get two per month). Unlimited followed cases (free users will get two active follows). The pricing for this will be $30 per user per month. Over five users, the monthly cost is reduced to $25, and over 10 users, the cost is reduced to $20. The company will also offer enterprise pricing and discounted pricing on pre-paid annual subscriptions. All users – paid or free – continue to get unlimited case searches. First, because the NEFs sent to Sidley were misleadingly labeled, the lawyers assumed the documents were unimportant and did not immediately click through into PACER to view them. However, had the Sidley lawyers received the PacerPro email with the documents attached, it is far more likely they would have read them when they received them, regardless of whether they were at a computer or reading email on their mobile phone. Second, in the AT&T case, although the court initially mislabeled the order on the docket, it then corrected the docket three days later. It did so, however, without sending new NEFs to the parties. Had Sidley been using a service that automatically updated the docket listings, someone may have noticed the change and been alerted to the discrepancy between the NEF and the docket listing.